It’s that time of year again and CES 2016 is in full swing with more new technology than you can shake a stick at. It looks like Samsung is taking on Microsoft’s Surface with its own Windows 10 tablet. 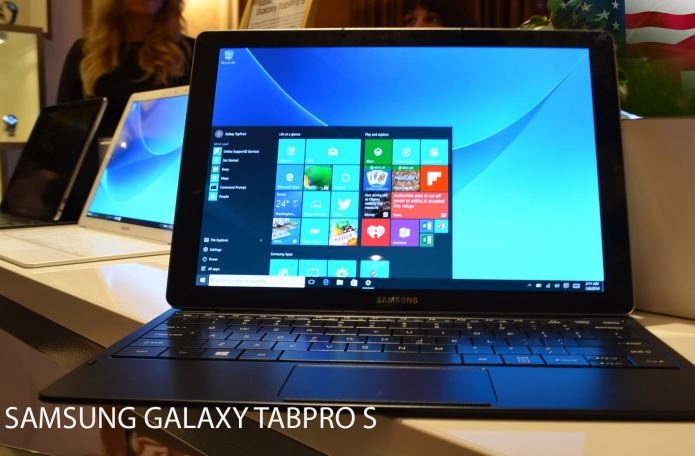 Here’s our Samsung Galaxy TabPro S hands-on review from Las Vegas. The idea of the product, according to Samsung, is combining a laptop and tablet into one device to offer productivity on-the-go. This category, normally called convertibles or hybrids, has been around for a long time but Windows 10 is helping to make them better. The TabPro S will start sipping globally in February and we can assume that it will come to the UK, which is a key market for Samsung. There’s no official price but we expect it to be priced around the £500 mark at least if not more. The keyboard dock/cover comes with the products whereas the Surface Type Cover is extra. Although we’ve seen many Surface clones, the Galaxy TabPro S takes a different approach to design. There’s no kickstand but the included keyboard case provides a similar experience. The ‘Pogo pin’ metal contacts mean no faffing about with Bluetooth to connect the keyboard. The case attaches to the tablet magnetically so you can pull the two apart very easily if you want to leave the keyboard behind. It works very well, snapping into place in a similar way to the Surface. The case, however, only offers two viewing angles, which is where the kickstand is superior. 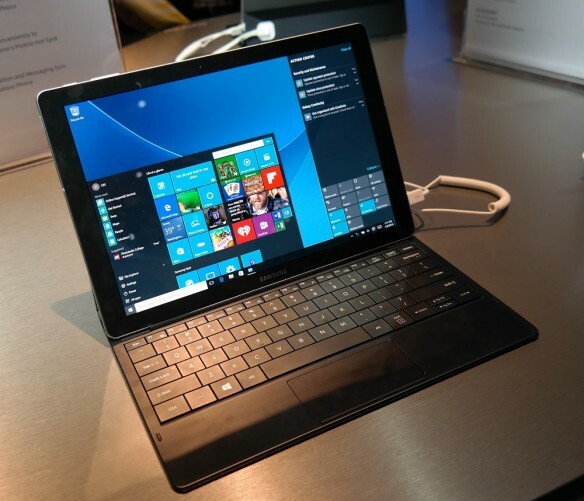 In appearance, the Galaxy TabPro S looks very much like the other Tab S products from Samsung which run on Android. The Pro is impressively thin and light at just 6.3mm and 693g. At 12in the screen is larger than most tablets but this make sense for the Galaxy TabPro S since it’s taking on devices like the Surface which are about productivity. The screen uses Samsung’s favoured Super AMOLED technology and has a crispy 2160 x 1440 resolution. Inside is an Intel Core M processor (6th generation Skylake) which is 2.2GHz and dual-core, 4GB of RAM and a 128GB SSD. Going by the spec sheet, you’ll be able to choose between Windows 10 Home and Pro editions. Other internal specs include NFC, 11ac Wi-Fi with MIMO, Bluetooth 4.1, GPS and there’s also LTE Cat 6 listed although you can choose a Wi-Fi only model if you don’t need a cellular data connection. Samsung has chosen a USB 3.1 Type-C port which is the latest edition and reversible. It’s a shame that there’s no full-size USB port which is almost needed for a Windows device but Samsung has an answer, sort of. An optional accessory, along with a stylus, is a multi-port adapter which provides HDMI, USB Type-A and USB Type-C ports. There’s a 5Mp camera at the front and the back should you need them and Samsung claims that the Galaxy TabPro S can go all day long with a lengthy 10.5 hours of battery life. Fast charging means the 5200mAh battery can charge to full in two and a half hours. Aside from only offering two viewing angles, we’re impressed with the typing and touchpad experience of the TabPro S keyboard case which seems to be close to that of a proper laptop after a quick play. As usual, the price is a key missing element here but we’re impressed with what we’ve seen here. The lack of a kickstand and proper USB ports will be a turnoff for some. However, those wanting a really thin and light Windows 10 tablet with decent specs and the option of adding the keyboard case when needed are likely to be pleased.